Outlook is one of the finest email programs out there, which is available for both Windows and Mac users. However, it has one limitation that makes importing data from other formats that are not difficult. Outlook uses its own proprietary file format to import, export, backup, archive, and other operations with the data. To get the data imported from other clients not Outlook. One will have to face a few problems that may be too big for many users, beginners or otherwise. In this post, we are talking about importing data from EML to PST files for Outlook Mac and Windows. EML is a native format used in Windows Live Mail. It’s been since standard for storing email messages. EML format is used in many clients and programs, but sadly, not Outlook. Outlook uses its own proprietary format in Windows called PST and OLM in Mac. But the good thing about PST is that it is also able to import data to Mac Outlook. To get all your data from EML to Outlook, you have to first convert EML to PST. There are other manual ways too. Syncing data to a server using your Live Mail or other client that supports EML format. Therefore again syncing it back to Outlook from the servers. But manual solutions like these are not worth your time. As they take too long and are not always precise in getting everything from the files and are hard to execute. Most users can compromise with few of the shortcomings of the manual methods, but it’s hard to accept the loss in data. The one and only solution most would recommend is convert EML to PST. But it’s not that simple to just change the files from *.eml to *.pst extensions. You are going to need some third-party solutions to do so. The ordinary EML to PST converters do not reach to every part of your files, to the furthest corners. Which leads the failure to get the precision in output data that users need. There are lots of tiny details associated with emails that are important but are not processed by most file conversion utilities. The trickiest are images, attachments, the structure of folders, metadata, headers, MIME formatted data, and Unicode text. If you have tried the common EML to PST converters, you would find these elements in your database not correctly moved or converted. You will find broken empty areas where images were, the text characters in other languages like Chinese (using DBCS standard) do not appear correctly or at all, and other similar quite frustrating gaps in data integrity. To deal with this problem, Gladwev Software came up with a professional Windows based tool, called “Mail Passport Pro”, which can be effective in both large-scale projects involving data migration and small scale. So, whether you are a beginner who just wants to convert the personal emails from EML to PST Outlook or an IT professional who is handed the task of getting a large amount of data successfully moved without integrity damage, “Mail Passport Pro” is for you. The developers at Gladwev Software built it from the scratch. The process the tool implements to target the information within the EML files is precise down to the tiniest byte of information. So, you will not face any missing images, attachments, or anything that is not converted with regular EML to PST conversion tools. In addition to that, the tool now brings much required feature to map the folders from EML to PST without changing their original location in the hierarchy. Imagine finding all the folders in a different structure and location than originally in EML files. That is what a large portion of ordinary EML to PST converters do; they do not map the folders in their correct order, making it a painful task for users to later arrange them or make sense of their data. That is not a concern anymore. You can easily convert EML to PST in no time, get all the data elements moved securely, and be done with an otherwise challenging process without efforts. The tech support of Gladwev Software adds that final missing link that could make an otherwise decent software solution inept. The 24 x 7 available support team will get you out of any situation you feel wedged in and not able to get out on your own. There are cases where some unique cases of users’ databases might raise some queries in them, and then, a team of experts backing you up is a priceless feature. That is what makes “Mail Passport Pro” a complete package of tool and service from Gladwev Software, and not merely a file converter that you can find plenty online. The free version converts ten items from each folder inside the EML Files, while the full version can convert unlimited files, folders, and everything inside them. The free version can let you check out all the features and the interface of the tool. Click the link below to download the setup file. Note that “Mail Passport Pro” is actually a full conversion utility for all email file formats and databases in Mac operating system to Outlook PST files. So, you can convert more than just EML to PST and also you can convert your Apple Mail, Outlook for Mac, Thunderbird, Gmail, Postbox, Entourage database, and even standard MBOX files. The people who have their mail data stored since years in the Apple Mail format and are moving to a new device, converting the mails into the format of the new mail client is integral to their safety. Instead of using the manual method, however, we suggest you to use the Mail Extractor Max. This tool takes away the difficulties involved in mail migration and allows them to easily migrate the data to the choice of the format of the client. In opposition to consuming large chunks of time while converting Apple Mail to the format of the choice of the clients, the Mail Extractor Pro finishes off the task in least amount of time possible. Thus the client is saved not only from a lot of complicated steps but also saves large amount of time. Having the Mail Extractor Max as one’s mail converter tool is a lucky chance for anyone since it is within the ambit of all kinds of users. No client finds is operation tough thanks to the user-friendly GUI of the tool. Even people with no idea of the methods involved in to migrate mails can use this tool to convert their mails like a pro. All kinds of unique and different content are kept in their original state by this tool. It has the ability to recognize and work with different kinds of text elements like metadata, Unicode, headers, non-English languages, double-byte characters etc. The capacity to convert files of non-English languages is crucial since it is common to receive mails from one’s international clients, and this tool provides that rare service. In addition to this, it also preserves mail attachments in their proper order. This feature lets the client choose as many files as they want at once and convert them in batches. This feature is quite helpful in speeding up the process of conversion and saving the clients’ time. It is indeed preferable to converting files individually which consumes large amounts of time. We have got a free trial version for the sake of the clients who would like to check the usefulness of these features for their need. Speed and interface can be tested through the trial version as well. The link to this version is available with the full version of the tool. If you want to know more about the tool or need any kind of help, feel free to contact them. Get your free trial here – https://www.mailextractormax.com/ for Apple Mail conversion. Searching for answers on “ How to convert OST to PST”? Well if you have been looking for answers for how to “open ost in outlook” or something to similar to it. Then you are at the right place. As we move ahead with this article we will be answering all these questions for you. So keep reading. Why do you need “OST recovery”? An OST file is an offline file that is used by the windows Outlook to save all the files that are not uploaded to the server. This gives the freedom to the users using the Windows Outlook to work offline even when they do not have an internet connection. Also, not only this but the back up of all your emails is also kept in the OST format so that you can use them as and when needed. If you try and delete this backup file still the Outlook will create another backup OST file for the backup purpose. This was all about the OST file. But one of the important things about the OST files is that they are the offline files and cannot be used by the users directly. That is, the user needs to convert the file in “OST to PST” file so that they can make use of the data. Now this conversion cannot be done manually, hence you need a tool that can help you with the recovery and the conversion of the data. Many of the tools available in the market provide with the recovery of the data. But the main issue with all such tools is that they do not provide 100% data recovery. Now when we talk about 100% data recovery it means that the data that is present in the OST format is not usable by the users when recovered in the PST format. The data is either in the metadata format which is useless for the users or the data that is recovered is in the Unicode format. A data that is not fully readable by the user is more or less useless. Also, the tools available in the market do not address the issue of the recovery of not text data. The non-textual data can be your presentation files, can be your images or the audio and video clips. Hence a tool is needed that can help you in recovering data that is not only in the text format but also the data that is not in the text format. One such conversion tool available in the market to help you with the recovery of OST file is the OST Extractor Pro. It is an amazing tool that is designed for the home users and also for the professionals. The user interface is so simple to use that it makes it easy for the home users that are using the software for the very first time. No prior technical knowledge is needed to use the OST Extractor Pro. With OST Extractor Pro you also get ost to pst converter free download in the form of the trial version. Quickly Recover OST files using the trial version of OST Extractor Pro. Try OST Extractor Pro to recover ost files and it works on both Mac Windows OS. If you don’t wish to use the full version of the software immediately, use the trial version of the software now. It is available on https://www.ostextractorpro.com/. It is the safest tool in the market. How the files are recovered by OST Extractor Pro? You are aware of the OST file and its limitation. But let me briefly describe what these files are. OST files work offline and helps users to work when there is limited internet connectivity but they cannot be imported to the online servers directly due to their properties. OST files can’t be used by email clients directly. To recover or repair the data in the OST files, we need to convert them in PST format or any other format according to the requirement. The whole process becomes really simple once the files are converted to PST format. OST Extractor Pro recover, repair and convert the files into the required format. It also helps in exporting the files to the online servers. Trial version helps in recovering the files for free. Trial version can convert ten items within each folder. So you can test the functionalities of the tool very easily. The UI is very friendly and advanced. The user finds really comfortable working with the tool. Everything is mentioned on the help property of the tool. User has to follow the instruction and convert the files. Only few steps are required to be followed. The data can be in any format. Tool accepts all the languages like Hindi, English, Japanese, Chinese, etc. It accepts all the file formats. Attachments like images, videos, notes etc. is easily converted by OST Extractor Pro. It has such a wide range of input formats that everything that goes inside the tool is recovered. The tool converts the data in no time. It converts XGBs of file in couple of minutes. The process is so fast that files with small size are converted within seconds. Everything is recovered from the files. It gives you 100% recovery guarantee. No matter how big and complex the file is, tool takes care of everything and gives 100% accurate result. Damaged files and password protected files are also recovered with the help of the tool. Hurry up and download the tool. You can try the trial version anytime. There is no sign up required, no configuration required. Just download it from the page and start using it. No cost required to use the trial version. Test all the functionalities and then download the full version of the software. For windows & Mac: https://www.uslsoftware.com/convert-ost-to-pst. How to convert OST to PST is one of the questions that most of the users are dwelling the internet to find the answers to. It is but obvious that when it comes to converting and recovering your lost data from the OST files into PST format it is but obvious that the uses might be having many questions regarding the same. This article is going to help you in finding answers to most of the questions asked by the users on the Internet. These are also the questions one must look out for before making the purchase. What all can the OST Extractor Pro convert files into? The developers of the OST Extractor Pro worked really hard in finding solutions that could not only convert the OST file to PST. But a tool that could help the users in converting OST to PST, Thunderbird, post box, Mbox, EML, Apple mail archive etc. The software will work fluently and efficiently by converting your data without jumps and hoops. Can the software be used by professionals? While developing the software the company focused not only on helping the individuals but also to help the professionals in the IT sector. It came up with multiple plans where the individual could use the software according to their use at minimal prices. Not only this but the professionals who are working up to 50 clients or the professionals who are having more than a hundred users could also make use of this software by purchasing higher packages of the software. What all files generated sources does the OST Extractor Pro support? The OST Extractor Pro supports all the files that stores in the windows Outlook. Other than this it also helps in supporting other formats other than Outlook files. The other extensions that it happily deals with are Office 365 Outlook subscription, Outlook versions from 97 to 2017, and last but not the least ANSI OST Files. Not only this, but it also allows to install all the PST files without any efforts in Windows and Mac. Does it take multiple output options? Yes OST Extractor Pro is well functions in this format and platform also. The software was made after must research and survey of what the market was actually looking for and what the other OST to PST extractor tools were missing out on. The OST Extractor Pro supports the output formats like Mbox files, EML files, Apple mail archive files, Thunderbird files, and post box files. Yes, OST Extractor Pro gently extracts and imports all the PST files with ease. If found that the PST files are big to handle it will automatically split the large PST files into multiple segments so that the efficiency of the software remains the same. Through this article, most of the questions asked by the users must be answered well and will also tell how efficient the OST Extractor Pro software is. Hence if you wish to convert OST to PST for Outlook for Mac & Windows you must download this software now. There is a great rivalry among email converters currently as the procedure has grown vastly prevalent among common email users. Every second program declares to be the finest at moving the user’s email data. Hence, making it challenging for inexperienced users to choose one particular tool from such a vast number of choices. Rendering to the existing trend, it is very normal for a mac outlook user to export from OLM to PST format for windows Outlook. This is primarily due to the ease and efficiency that the MS Outlook app offers to its customers while also safeguarding their email data. Why are Outlook mac users Exporting OLM files to PST? While the MS Outlook client is superior in terms of protection, file safety and range of accessibility, it is also more simple to use and easily available worldwide for all types of users. This is the prime reason why such a huge number of Outlook mac users are frequently found shifting their OLM files to PST for MS outlook. How to successfully Convert OLM to PST? Irrespective of having access to endless alternatives that pledge to deliver the safest OLM to PST conversions at bargained prices, smart users have one thing mutual, the fact that they never settle for mediocre. This is largely due to the reason that low-priced methods are seldom able to fit the performance and outcomes that specialized tools bring, and licensed tools are chiefly designed to cautiously Export OLM to PST for without risking the treasured email data. Thus even a novice email user can count on a professional tool and stay pressure free about the safety of his data. Is there a particular tool that can assure harmless and safe OLM to PST transfers without exposing data to loss? Certainly, there is a program that has been precisely devised to ensure that all common email users can profitably export files from OLM to PST, whenever they want. It has been invented after broad investigation and thorough planning, and it is known as the OLM to PST Converter Tool. What is the OLM to PST Converter Tool? The OLM to PST converter is a specialized tool that allows common mac Outlook users to effectively convert their OLM emails to PST without risking their crucial email data. This tool provides full assurance of safety and also confirms 100% precision in results during all migrations from OLM to PST. 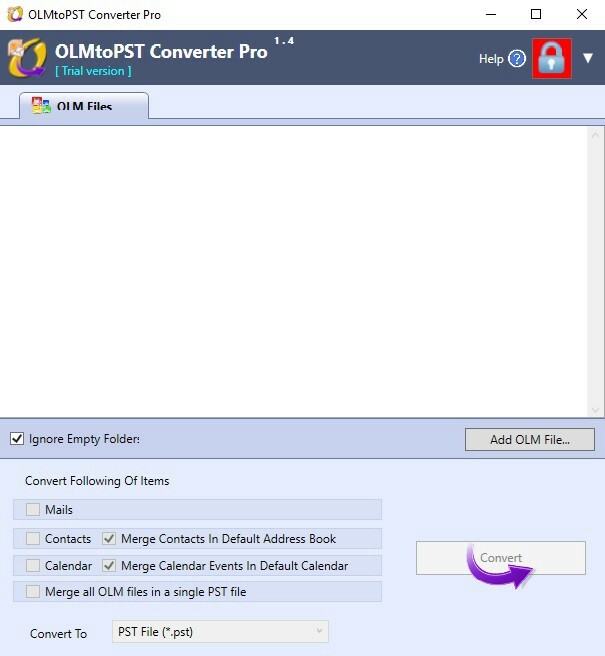 If you also have been desiring to discover a futuristic way to steadily Convert all OLM files to PST for Outlook windows, the OLM to PST Converter Tool might be perfect for you. Feel free to give it a try. Test the free version and if you feel satisfied, go ahead and grab the easily affordable full version for your own and specialized OLM to PST conversions. Try it today. Today I am going to survey one of the top tools amongst the most well-known OLM to PST converters out there. It is none other than the OLM to PST converter pro. This progressive device by Gladwev software has unquestionably changed the entire scene of email conversion and made it feasible for a large number of clients overall who beforehand couldn’t have envisioned being capable at the email conversion process which was at one time a process left for the pros or top of the line clients. So I took the OLM to PST converter pro in for a test run and this is the thing that I found about the device which clients are right now utilizing to import Outlook for mac to PST. I never felt even for a brief moment that I am utilizing a device which is high end. Everything is so simply put that you needn’t bother with any instructions to make conversions or whatever else. The OLM to PST converter pro can be introduced in under a moment and that is only the beginning of the execution of this tool. It is guided by a supportive wizard which directs you from the earliest point till the end of the conversion process. Another important aspect concerning the import of your outlook for mac to PST with the OLM to PST converter pro is its client interface. The OLM to PST converter pro brings a surprisingly straightforward and mess free user interface. Everything is put skilfully where it has a place and nothing is left for disarray. The entire look and feel is perfect and composed. The OLM to PST converter pro is a professionally certified email converter which is exceptionally intended to deal with your email connections which are maybe the most vital piece of your email information. It moves the whole mailbox with all the contacts and places them in the new application right where they have a place. The OLM to PST converter pro is the main device in its segment which holds the ability to give complete security to the clients’ email information. This claim is fulfilled with complete confirmation and that is the thing that sets the OLM to PST converter pro separated from the various tools. The OLM to PST converter pro is likewise the main apparatus which ensures no bugs or mistakes and subsequently raises the precision level to a 100%. This is a gift for pro clients who bargain in confidential information and can’t bear the cost of losing their records at any expense. The OLM to PST converter pro an exceedingly productive OLM to PST converter which fundamentally succeeds in making everything simple for a typical mac outlook user. This incorporates complete movement of messages including the contacts and calendars. With this tool, all documents are moved and their data folder hierarchy is not influenced. The records are sorted consequently and sent into predefined folders alongside the read/new status in place. So this is how I find the OLM to PST converter pro. I propose you to try it for free in the event that you are intrigued. The company gives a free form for limited use. When you are satisfied you can simply go ahead and get the full form at the most reasonable prices. Have fun, and good luck. Get it today to import Outlook for Mac to PST.